A funny thing happened on my way to the review of The Dumb Girl of Portici. I stumbled upon its director, Lois Weber. Milestone Films has just released a 2-disc set (Blu-ray or DVD) of this newly restored 1915 film starring the legendary Russian ballerina Anna Pavlova. “Wow!” I said to myself. “Pavlova’s only movie!?! This I’ve got to see!” ... and all the while being oblivious to who directed the film. But as I watched Pavlova, I saw that the film itself was something special. Portici was not the quaintly primitive old-time silent movie I’d assumed it would be. Instead it had a very modern look and soon I was watching the film’s visual choreography more than the dancing. Who was this Lois Weber person? Quick! To the Internet!... down the rabbit hole and the review of Portici was temporarily set aside. I learned that Lois Weber had been one of the three biggest directors in Hollywood during the 1910s. Apparently she had been the highest paid director in 1916 and a peer of D.W. Griffin and Cecil B. DeMille. Then her career tanked in the roaring ’20s, and like an Orwellian Unperson, she dropped off the map. For 70 years Weber’s legacy was a victim of sexist old-school film history, but it’s curious her reputation didn’t have a revival with the rise of Women’s Studies and the maturing of film history. We’ve had 30 years for her name to be as big as Griffin’s and DeMille’s but that has not happened. I agree with author Anthony Slide when he speculates in his biography of Weber ( Lois Weber: The Director Who Lost Her Way in History 1996, Greenwood Press) that she was too politically incorrect for the first wave of women film historians and thus did not get the historical revision she deserved. Slide makes a comparison of Weber to Woody Allen but I think the better match is with Leni Riefenstahl (which he also makes). For one thing, Weber and Riefenstahl were visionary and I find Allen to be “just” talented and competent. But in all three cases, appreciation of those filmmakers’ art is clouded by political/ethical/moral prejudice. Riefenstahl’s name stayed in the history books via Nazi infamy, while Weber’s name was dropped because she was the odd-girl-out in the all-boys club of Hollywood directors... no surprise there. The fascinating thing for me is that Weber was then snubbed a second time around. Weber should have a much higher profile today but she doesn’t. Weber’s PC sin was that she was an old-line, women’s-place-is-at-home, stand-by-your-man, bourgeois traditionalist. Apparently being ultra-progressive in the areas of birth control, equal wage/fair wages, opposing the death penalty, and generally being pro-social-justice did not make up for that domestic wrong thinking. Weber’s case is a little like that of her contemporary Margaret Sanger. Sanger was a guiding light and pioneer in promoting birth-control while standing in the shadow of eugenics... white washed with one brush, tarred with the other. But now Weber’s years in the wilderness seem to be over. Today an internet search will turn up screenings of her films at film festivals and new books and documentaries are being made about her. Perhaps a younger generation of Film Studies scholars are resuscitating Lois Weber’s memory? 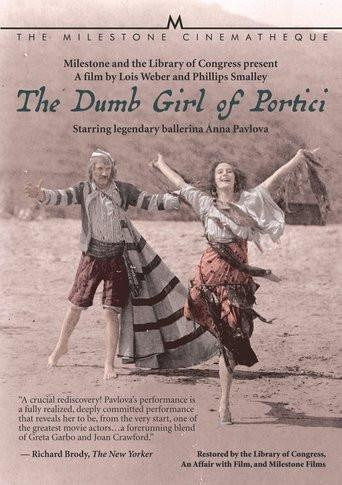 So a readily available catalog of Weber’s films like The Dumb Girl of Portici are just what the doctor ordered. Thus armed with my new-found Weber knowledge, I returned to the reviewing task at hand. As noted, Portici was not the film I was expecting to see. It starts off on an awkward but perhaps predictable en pointe step with a dance scene showing off the main attraction, Anna Pavlova, as she runs through a few ballet moves with an “invisible partner.” And why not? Give the customers what they paid to see, up-front and right off the bat! With the formalities out of the way, Portici dives into an adaptation of an early 19th century French opera which just happened to be the same opera that Pavlova and company were performing in Chicago at the time. The opera’s libretto tells the story of a 17th century Italian peasant uprising against their cruel Spanish overlords. The downtrodden little guys fighting the rich big guys... right up Weber’s crusading social justice alley! Pavlova gives it all she’s got by dancing over all kinds of difficult terrain (no going up onto your toes in the beach sand!). She can’t just walk across the frame, she has to flash and dazzle across it. She’s really too old to be The Girl, so although the camera always stays on her, it’s usually only at a distance and the few closeups are a little awkward. At this point in her career, Pavlova was a superstar but past her athletic prime. But who cared? Getting Anna Pavlova in front of a movie camera was the whole point of this film exercise... and she is still fun to watch today. The 17th Century costumes in Portici are amazing and I wonder if they were part of the troupe’s Chicago production. There are a couple ballroom scenes that seem to have come right off the staged version and are really out of place when dropped into Weber’s inspired direction in the rest of the film. But everyone understands that this is a dance film so there had better be a lot of dancing. Throw in a few overly melodramatic scenes (it is 1916 after all) and you’ve still got an enjoyable movie for today’s audience. The Portici disc set also comes with some Pavlova extras, most notably The Immortal Swan an odd little paean to Pavlova made in 1935, 4 years after her death. Swan comes close to being a parody of highbrowism but was done in earnest. If you laugh, do so quietly and please don’t point. The extras also included some Pavlova home movies shot on vacation around the world... Pavlova in Bali! Milestone has stepped up to the plate a second time with a restored version of another Weber film: Shoes, also from 1916. If The Dumb Girl of Portici is Lois Weber’s The Birth Of A Nation extravaganza, Shoes is the type specimen of the Weber species. Weber, who was born in 1879, was part of the idealistic, social-justice-minded Missionary Generation typified by Jane Addams. As a young woman, Weber worked with the poor, particularly with women struggling as mothers and homemakers in the depression years of the 1890s. Weber came to filmmaking with a hard-won moralizing social agenda. She said without a blush that her movies should be and would be used as propaganda in the service of that moral agenda. Shoes is the story of Eva (Mary MacLaren) a young woman who, in desperation, sells her body in order to buy a new pair of badly needed shoes. Eva is scraping by as a poorly-paid shop girl down at the five-and-dime. Her wages are the only regular income for her family as her father is a low-life layabout and her harried but saintly mother has her hands full with the two younger daughters. They are having a hard time keeping everyone fed while still paying the rent. We see Eva’s nightly ritual of replacing the cardboard inserts in her failing shoes… inserts which wear out before she can get to work the next morning and resulting in Eva getting splinters in her feet at her dead-end job. She needs new shoes or she’ll be out of a job and then everything really will go to hell or worse. Backed into a corner, Eva hooks-up with a sleazy nightclub singer for a one-night stand and a new pair of shoes... the same shoes she has been admiring in the shop window she passed every day. Did she get paid for the nights work or was it barter? We don’t know. But Eva’s mom knows the score the next morning when she sees the new shoes on Eva and then everyone looks sad, ashamed and resigned to their fate... end of story. There is no fake Hollywood resolution to Shoes. It’s more of a case-study in poverty... an After School Special with Weber’s “here’s what’s wrong with the world” message sent, and mission accomplished. Lois Weber’s deft directorial hand is seen throughout. She forces the audience to look and learn with dramatic closeups and creative camera work like the closeup of Eva’s wet ragged shoes as seen from behind and at street level as she slogs to work through a rainstorm. Weber, who has a wonderful eye for details like worn carpets, watered-down milk, and children sneaking food, makes us see the human cost of poverty. That’s what great directing is all about: having something to say and saying it with style. As noted above, Lois Weber was one of the Missionary Generation and I think that was the real reason she faded from sight in the 1920s. After the shock of the First World War, the Lost Generation took over popular culture and Weber’s old Missionary mindset did not play right with the kids. Simply being a woman was not what brought her carrier down. It was her out-of-date moralizing... 23-skidoo! Lois. In a brilliant example of Weber’s fall, the Shoes disk includes a mocking 1932 send-up titled Unshod Maiden. This heavily edited version of Shoes has a wise-cracking voiceover added that seemingly is without any sympathy for Eva or her poverty. Unshod Maiden is particularly strange when you consider that 1932 is the bottom of the Great Depression. Apparently misery does not love company. Weber goes unmentioned in Unshod Maiden though perhaps some in the audience might have remembered who had made the original film. Shoes is not mocked because it was directed by a woman; the film is mocked because it is old fashioned both technically and morally. Apparently Unshod Maiden was such a hit that a series of silent-era spoofs was planned. But then the voiceover wisecracking gag wore thin and public attention strayed. Shoes also comes with a commentary track by Shelley Stamp, another author of a recent Lois Weber book and a silent-era film scholar, who gives a state of the art dialectic on Shoes and Weber. My feeling is that film studies and the study of Lois Weber is in a dynamic phase right now, so it will be interesting to see how this commentary weathers the coming years. Meanwhile I recommend getting on the Weber bandwagon right now. The Dumb Girl of Portici and Shoes are great places to start. Jake Carson: Hey, this is cool. I love ballet films, sounds like I'll have to see Pavlova in action. Was there any music for these films? Like real ballet music, or minimal, or what.